You may be thinking, "Why would I spend a dollar to quiz myself?" Because you can give this to your students when you are done with it! This is a fantastic end-of-year review for your students. Print it out and give it to them to review the key points of the major time periods of Japanese history. Best yet, use it as part of their final exam! 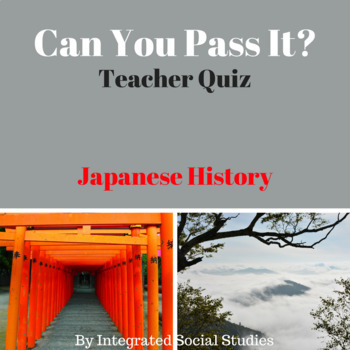 This fun quiz is a great resource for those of you that must teach Japanese history but maybe don't know enough to teach it yet. Have to learn it quickly? This outlines the important time periods and highlights the need-to-know events. This product is NOT an entire history curriculum and is intended to be used as a reference. Remember, TpT gives you credits towards future purchases if you leave a review! If you are unable to leave a 4-star review, please let me know and I will see if I can accommodate you. Follow my store above! I add new products often and throw sales randomly. You wouldn’t want to miss out.